My, my, Grandma, what a heavy 5 o'clock shadow you've got. The better to make you laugh, my dear. After all, whoever heard of a grandma who has to regularly shave a beard? In fact, though, Grandma is no lady. She's Barry Lubin, a friendly, middle-aged man who plays a mischievous older woman for the Big Apple Circus, which begins performances today at Dulles Town Center with its new show, "Celebrate!" 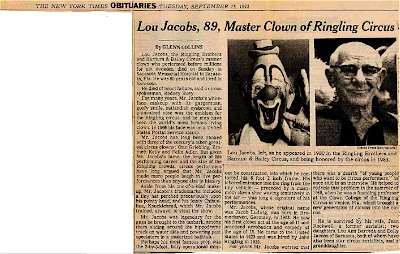 On and off for a total of 16 or 17 years -- he's lost count at the moment -- Lubin has been one of Big Apple's star attractions, putting on a curly wig, bright-colored dress, string of pearls and, of course, a traditional clown nose to transform himself into Grandma. The character, who among her many talents can perfectly flip single kernels of popcorn onto her tongue, has become the Big Apple's most famous face. You instantly know it's time for funny business under the big top whenever Grandma's in the house. "Do I love doing it? I love it more than ever," Lubin declares one recent afternoon during a break in rehearsals at Big Apple's headquarters in the town of Walden, New York, about an hour north of Manhattan. Out of makeup, Lubin looks like an average guy, like he might be coach of a Saturday morning soccer team or maybe your school's most popular teacher. In any case, he shares with Grandma a mild-mannered friendliness that invites people to approach him. You'd think that getting into Grandma's get-up 350 times a year would become a bit boring. But Lubin says that getting a circus crowd going is an endlessly rewarding way of earning a living. "We pass this off as work," he says with a grin, as the practice ring in front of him fills with rehearsing jugglers and tumblers. "I took on Paul's idea that this is my living room, and you are our guests." The Paul he is referring to is Paul Binder, a founder of Big Apple Circus and its original ringmaster. Lubin, a graduate of the Clown College that Ringling Bros. and Barnum & Bailey Circus used to run in Florida, says Binder hired him in 1982 to be Grandma, a character Lubin invented before coming to Big Apple. The two men hit it off instantly, Lubin says. "And he empowered me to upstage him." Grandma's job is to be a kind of ambassador between the audience and the magic in the ring. She roams the crowd and sometimes pulls unsuspecting spectators into the spotlight. This usually goes well, but you never know. When it doesn't, Lubin has learned how to get out of the situation gracefully. Talking to the man behind the woman, you become curious: Does Grandma think she's funny? Lubin grins. "Hmm, I've never been asked that before. When I teach, I tell the students that what you think is funny is irrelevant [not the point]. It's the audience that decides." 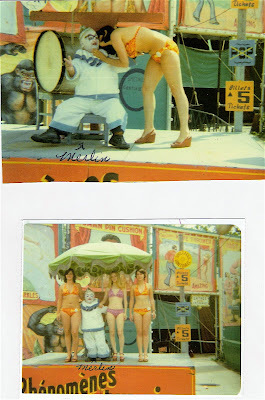 One of my very favorite comedy magic acts, Kohl & Co.
Master Clown Lou Jacobs' (and Knucklehead's) segment of the Charles and Ray Eames short CLOWN FACE, a 16 minute film of Ringling Bros. and Barnum & Bailey Circus clowns applying their makeup. CIRCUS SARASOTA: "Circus Traditions in Modern Times"
Pedro Reis, (Lou Jacobs' daughter) Dolly Jacobs and Chuck Sidlow discuss Circus Sarasota and their approach to presenting a mix of classical one-ring circus combined with the latest developments in technology, culture and circus arts. My father, his brother, died when I was a child so we lost track of Merlin. Didn't know he was known as "Shorty" until about 2 weeks ago. I was desperate for genealogy, searching for clues and I remembered a recent story my brother told me about when he was a Pennsylvania State Trooper back in the 60's. He came across a circus truck that had broken down on its way to Philadelphia. In those days there were no cell phones and it was quite a distance to a telephone. He called his station and then waited with the truck to make certain help would arrive. The driver thanked him and requested his name. When he noticed the name Hinkle he said the only one he ever knew with that name was a clown with them by the name of Shorty. My brother knew that had to be Merlin!!!! He never got to go to the circus in Philly but wished he had. So I was thinking last week I haven't found anything on "Merlin Hinkle" so I tried "Shorty Hinkle". And voila!!!!!!! What a find!!!! So thank you and Bill for providing the Hinkle family with Shorty's adventures. We can now follow him through time. The circus provided him with a wonderful life and family that otherwise he would have never had. 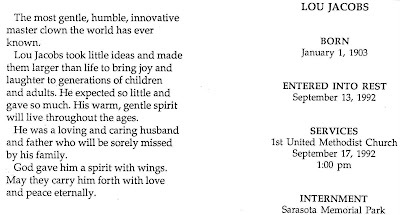 He was born Nov. 13, 1905 in Mt. Carmel, PA. The son of Amelia Hepler, daughter of Pitman, PA. farmers, and Joseph Oliver Hinkle, an anthracite coal miner. His mother died in a house fire when he was 3 yrs old. From the time he was 6 until he joined the circus he was raised by his mother's family on the Hepler farm. He was a flying monkey in The Wizard of Oz. When he became ill in the 70's he returned to PA to live with his brother in Ashland, but he hated the cold weather so returned to Florida 1974 or 1975. He died in February 1977 in Hillsborough, FL. I have his social security info but the date must be wrong as I can't find a death certificate from Florida or an obituary. The pictures above are from relatives. We assume the tall short haired brunette was Merlin's wife as that is how they described her. She was introduced to relatives as "Billy". No other pictures. No other info. The Crash Brothers (John Hadfield and Chris Shelton) perform their comedy juggling act in the Carnation Plaza Gardens during Disneyland's Circus Fantasy. 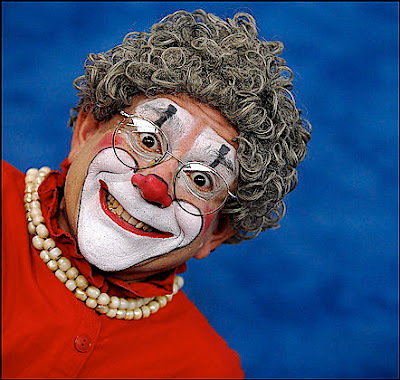 The Big Apple Circus, featuring Barry "Grandma" Lubin as well as Gianni Fumagalli and Daris Huesca (seen above) opens it's 30th season October 19th in Lincoln Center. Please click the title of this post for tour information on the B. A. C.'s completely re-designed website. Few circus and clown historians and even fewer Dylan fans seem to know about Bob Dylan's all consumming passion for classic American circus clowning. 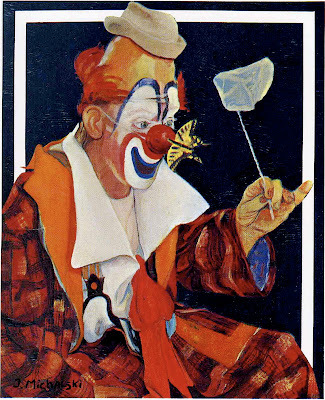 Growing up in Minnesota, young Robert Allen Zimmerman attended his first circus at the age of three and was immediately entranced by the clowns. As he got older he befriended and corresponded regularly with several members of the classic Ringling alley, especially Otto Griebling from whom he learned about the poetry of Jack Kerouac and the music of Woody Guthrie. Moving to Greenwich Village to join the New York folk music scene, Zimmerman (now Bob Dylan) was a fixture backstage at the Garden each spring throughout the early 1960s and, even at the very zenith of his counterculture celebrity, revelled in the any and all chances to help pad out the larger production gags like the Firehouse where his high, nasal "Fireman, save my bay-BEEEEEEEEEEEEEEEEEEEE!" could be heard echoing off the walls of the old Madison Square Garden. After his close friend Paul Jung's death in 1965 Dylan was inconsolable and dropped out of the spotlight for almost 18 months while he studied mime and clowning with Tony Montaro in the hopes of leaving musical superstardom behind and joining Clown Alley. 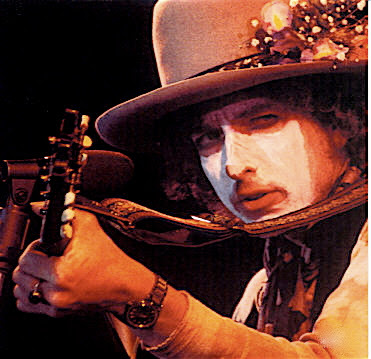 It was spring of 1967 before Lou Jacobs himself convinced Dylan that his skills and makeup were simply not up to an acceptable standard and that he should probably just return to his music. For his own good, a heartbroken Bob Dylan was not accepted to Clown College when he applied in 1968. 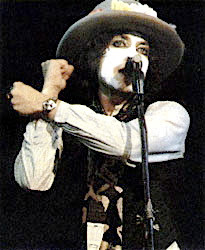 In typically Dylanesque fashion Bob denied that he had been studying clowning and instead he fabricated the unlikely story that he had actually been recuperating from a broken neck suffered in a motorcycle crash near his home in Woodstock, NY. Continuing his friendships with the likes of Lou Jacobs, Bobby Kay, Duane Thorpe, Mike Polakovs, Prince Paul, Mark Anthony and Frankie Saluto and "guest clowning" at the Garden each spring, in 1972 Bob Dylan did finally visit the Ringling Bros. and Barnum & Bailey Clown College in Venice, FL to play the students two songs that have still gone unreleased, one about his good friend Otto Griebling, the other about the death of Paul Jung. These photos are taken from his brief concert and the long yoga and mime class that he taught that afternoon. 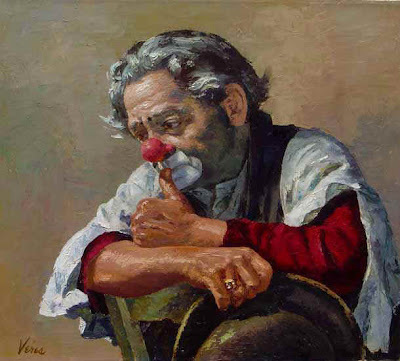 As evening approached he left the Venice Arena profusely thanking Bill Ballantine for the opportunity but never visited the show again and did not return to teach at Clown College. 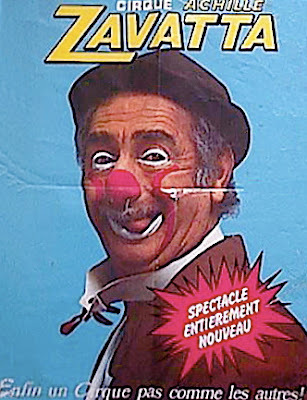 Disappointed that his sons Jesse and Jakob did not share his passion for circus clowning, Dylan strongly urged his youngest son, Todd Zimmerman, to apply to Clown College and was delighted when he was accepted. At the Kennedy Center ceremony in 1997 Dylan told President Bill Clinton that his greatest pride and joy was not in his own amazing and influential body of work but that his son currently toured with the Blue Unit of the Ringling Bros. and Barnum & Bailey Circus. Please click the title of this post to be taken to an EXTREMELY rare 1965 film that Dylan made to teach classic American circus clown blow-offs. It was used at the first Clown College class in 1968. Watch it twice and see if you can spot a teenaged Avner Eisenberg with a walking stick talking with Allen Ginsberg before walking off down the alley at the end. According to the Trigg Ison Gallery, the title of this work is "Lonesome: Emmett Kelley". It is quite obviously a painting of Otto Griebling. 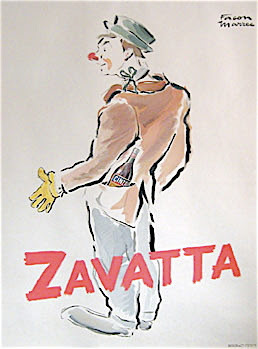 "Veres", having spent so much time around clowns and being a personal friend of Emmett's, would certainly have been able to tell the difference between the two, no? This painting is now in the personal collection of Ms. Geraldine Clark. This clip is from one of Snub's best films, taken from Robert Youngson's compilation, WHEN COMEDY WAS KING.